After a car accident, Adam wakes up in a hospital room with no memory and a man named Joe, who acts like his boyfriend. So when Joe says Adam is straight - and Joe's not - and they're just best friends and roommates, Adam is more than a little confused. But as Adam starts to fill in the gaps, the one thing that becomes apparent is that Joe is the missing piece that can't be replaced. This is a very short, very cute, GFY with amnesia! Adam wakes up not knowing who he is and everything about his relationship with Joe screams of something more than friends. He can’t help but see the longing in Joe’s eyes and though he claims they are only friends, with his amnestic mind, he wonders: why? As the memories begin to return, Adam remembers that it is Joe’s desire to leave their roommate situation that propelled him into the street, blinded by emotion, and into harms way. He realizes he doesn’t want to ever be apart from Joe and that he has probably been lying to himself for years about his true feelings. Luckily the couple has been granted a second chance to get things right, and with a new set of priorities, Adam convinces Joe to give a romantic relationship a try. I love the GFY story line. Add in amnesia and I was hooked! Chris Scully is a new author for me, but she did a great job of telling a great story in a few pages. We move quickly through the amnesia part and begin to deal with the much tougher relationship changing stuff. I was very glad to see there was a sequel and I highly recommend reading it as well, because it takes off where this ends, giving our couple their first explorations into being gay. I highly recommend this short story and give it 4.5 of 5 stars. Jeff Gelder is a recurrent narrator for this genre and he does a nice job. I was disappointed that the many Italians in this story did not have much of an accent, I thought that would have added a nice touch. The story is still good and he does a nice job of fading into the background, yet giving each voice enough distinction that we know who is speaking. I give the narration a 3.5 of 5 stars. 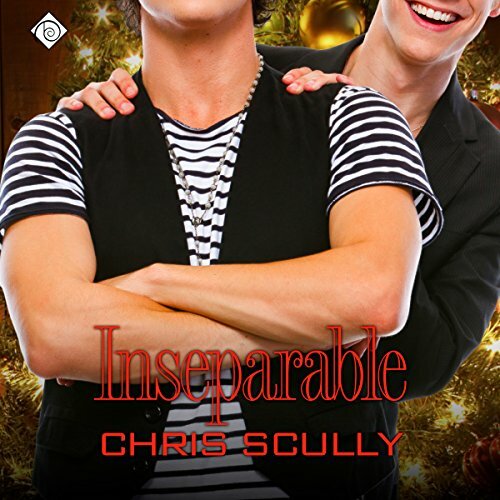 If you could sum up Inseparable in three words, what would they be? Who was the most memorable character of Inseparable and why? This was my original short thought on this book: Very cute and Joe, he was so adorable. Edit: Re-read this and liked it just as much. After reading When Adam Kissed Me I couldn't decide who I liked more, Adam or Joe, and I still can't. Now that I’ve listened to it – I love them both. Adam has temporary amnesia from being hit by a car. As his lifelong best friend, Joe is just horrified that he nearly lost the man. As Joe takes care of him, and as the memories start to slowly return, you get to see the love and devotion there is. Add in Joe’s extremely involved family, and no wonder Adam is a little overwhelmed. The narrator of this story, Jeff Gelder, just did an amazing job making the emotions of Jeff and the confusion of Adam so palpable. It’s very short so it was the perfect drive to work and home story, but I will be relistening to it. And now, I SO hope When Adam Kissed Me goes to audio! I think that Dreamspinner Press does such a wonderful job at packaging these romance/holiday theme stories. From the Advent Calendar package " Evergreen", comes the story of Adam and Joe. Adam wakes from a car accident to find himself in the loving care of his roommate Joe. He soon realizes just how much more Joe means to him than simply a roommate. I enjoyed the story and felt that the author did a really good job of allowing us readers/listeners to understand how hard it is to not love someone when they just might not love you back. I hope Audible keeps putting these short stories out for us voracious listeners. These stories are packaged 'just right'.